First time you enter the gallery space in Hamburger Bahnhof to see the solo exhibition of Julian Rosefeldt you have to go up the stairs. On the right side you come across the portraits of the well-known actress Cate Blanchett in different roles and different costumes. Somehow it reminds you that the work will be mostly about her face and about this collaboration to attach the spectator’s view from other point of view, it also seems to be an intro for the show. On the other hand Cate Blanchett often cooperates with underground artists and not so „great names“. Before you enter the whole installation on the left side of the staircase top, there are the papers reflecting to the exhibition, I mean the Manifestos from various artists from various times. 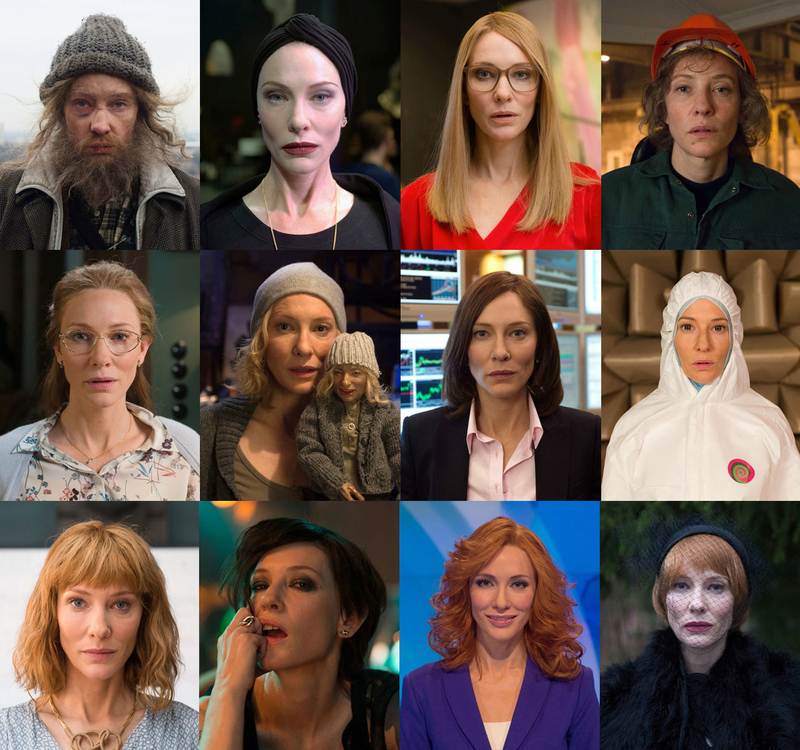 This archive of documents could be mention as a map through the whole artwork of Julian where he depicts on thirteen screens these manifests acted by Cate Blanchett in multiple daily life situations in Berlin districts. When you enter the room the entire space is covered with black carpet all over the walls and floor, there are also sound reflective spikes on the sides. I think it was a professional step to do it like this to get as much as possible from the concentration and attention of the viewers. The room is also separated into two different spaces because of the sound mixing. The sound is also well separated thanks to the speakers which are directional and aren’t so much disturbing other signals together. Technically the videos are projected via high quality projectors that are hanging in the air altogether with the directional speakers. Invisible and simple as much as possible.On the other hand installation is not so risking making the projections in a different way. We could say that it is only a collection of the short films projected in the room similar to the cinema space and we would be right. However the thing that is making this artwork an installation is the time of the video loops when the manifests and speeches are singing together. In this time everything connects the work in one piece and it is also atmospherical change in the mood of the room. In front of each projection there is a bench for the spectators to enjoy the view in a comfortable way, thanks to the carpet it is also possible to sit on the ground. From my point of view the videos are sorted in a well prepared order. The beginning is the intro with the manifest of communism prepared as a slow motion lightning of a fuse. On the left side there is a poor man walking in some abandoned satellite base in Berlin, on the right side there is a manifest of futurism sequenced in a picture of a broker in financial market. Other videos in the second part of the installation are worker in a garbage incineration plant that depicts the architecture manifest. Funeral speaker which is the conclusion of dadaism manifest, pupeteer which is connected to surrealism manifest. Teacher that talks about the film theory. There is also a punker, some party introducer, some scientist, ballet choreographer „From another world“ theatre show. In the end there is a conservative family mother who reproduces the manifest of pop art, this combination is really interesting and a reporter and news speaker that both talk about conceptual and minimal art. This video is maybe depicting a funny way of using one actress for different roles in one frame. The artwork is full of humor because it tries to implement these intellectual ideas into daily life situations. However the actress tries to make these situations as much theatrical as possible, also it is obvious that the film language is still visible thanks to the extras. It depends what Julian Rosefeldt wanted to show in the film, anyway it seems that it was done to be more promotional than bringing something new in a different way. However from my point of view it is a successful event.